The mayor and schools chancellor found little support for their plan to eliminate an admissions exam for the city’s specialized high schools. New York City’s mayor and schools chancellor faced harsh criticism at a community forum in Queens on Thursday night as speaker after speaker pilloried their plan to eliminate an admissions exam for the city’s specialized high schools. “Not only is the rollout racist, but the whole concept is racist,” said David Lee, an alumnus of Brooklyn Technical High School, one of eight highly selective schools where the sole criterion for admission is passing a competitive test. Lee’s remarks, and others like them, drew applause from a packed room on the second floor of Queens Borough Hall. The forum was the first in a series of community meetings on diversity in specialized high school admissions. It was held by state senators, including John Liu, a Democrat from Queens who chairs the Senate’s New York City education committee. How and whether to diversify the city’s highly selective public schools — where three in five students are Asian — is a question that has touched off fierce debate across the city. Anger has become particularly intense in the Asian American community, whose members rallied outside Queens Borough Hall before the forum as police officers looked on. In June, Mayor Bill de Blasio and Schools Chancellor Richard A. Carranza announced a plan to phase out the required exam for specialized high schools and replace it with a model that admits top students from each of the city’s middle schools. The city says the move will help boost diversity at specialized high schools, where blacks and Latinos account for just 10 percent of students, even as they make up nearly 70 percent of the city’s overall student population. Asian Americans are about 14 percent of the city’s students. Because the Specialized High School Admissions Test is written into state law, ending it requires legislative approval. Bills have been introduced in both the state Assembly and Senate. Some attendees expressed support for the mayor’s plan. “It's very offensive to hear all the racial coding that African Americans are not good enough, if more of us are accepted into the specialized schools that it’s going to bring down the standards,” said Mary Alice Miller, who had tested into a specialized school. But many said they disagreed with de Blasio’s call to end the test. Horace Davis, a Brooklyn Tech graduate and president of the Caribbean American Society of New York, told attendees that blacks and Hispanics accounted for many of the students at his school during the 1970s, ’80s and ’90s. He said the fact that the admissions process remains the same suggests the test is not to blame for the lack of diversity. He was one of several critics who accused New York City’s school system of failing black and Hispanic students long before they get to high school. The city, they said, should create more gifted and talented programs in boroughs with underserved communities and establish more specialized high schools. “Underrepresentation of blacks and Hispanics at specialized high schools is a symptom of a much larger problem,” said Davis, who noted that his child now attends his alma mater. “Our proposal will expand opportunity for the highest-performing students in middle schools across the City and make our specialized high schools academically stronger,” he said. A study from the New York City Independent Budget Office, released in February, found that if the system proposed by de Blasio were fully in place, blacks would make up around 19 percent of all specialized high school offers and Latinos 27 percent. Compared to actual enrollment numbers for the 2017-18 year, that’s about a fivefold increase for blacks and more than a fourfold increase for Latinos. Asians would still account for the largest share of offers, though their numbers would be cut in half, from 61 to 31 percent. For fall 2019 admissions, around 11 percent of offers went to blacks and Latinos combined, while 51 percent went to Asians and 29 percent to whites, city Department of Education data show. A total of 27,521 students sat for the exam. For many Asian American parents, having their children earn a spot in a New York City specialized high school is crucial to ensuring their academic future. The Calandra-Hecht Act of 1971, a New York state law, established the three-hour exam as the sole method by which students were admitted to what were then only three specialized schools: Stuyvesant High School, the Bronx High School of Science, and Brooklyn Tech. A fourth, Fiorello H. LaGuardia High School of Music & Art and Performing Arts, does not use the exam, instead basing admissions on a competitive audition and academic records. The city Department of Education has since added five more schools to the list requiring the test. Over the last few decades, schools like Stuyvesant, Bronx Science and Brooklyn Tech have seen their Asian American enrollment soar, as more and more people of Asian descent, among them first-generation immigrants, move to the city. Asians account for 74 percent of students at Stuyvesant, 66 percent at Bronx Science and 61 percent at Brooklyn Tech, according to school data. By contrast, blacks and Latinos combined make up just 4 percent of students at Stuyvesant, 9 percent at Bronx Science and 13 percent at Brooklyn Tech. The percentage of white students was 19 percent at Stuyvesant and 23 percent at Brooklyn Tech and Bronx Science, figures showed. 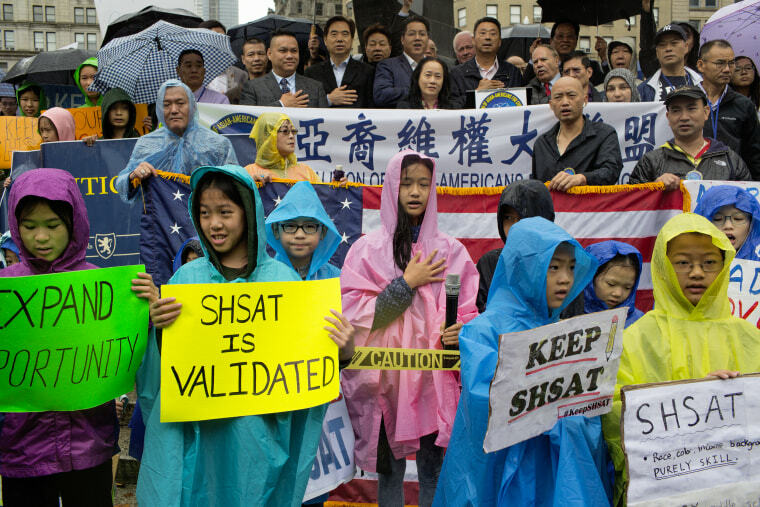 Asian Americans in favor of keeping the specialized high school test view de Blasio’s proposal as an attack on fairness and merit-based admissions. But others, among them Asian Americans, argue that using a single exam to decide who gets in prevents specialized schools from recruiting multiple levels of talent among people of color, particularly blacks and Latinos. A Quinnipiac poll released in early April showed that 57 percent of New York City voters say other factors should be considered in deciding who is admitted to specialized high schools. Asian voters appeared split on the issue. Forty-eight percent said other factors should be considered, while 46 percent said the single exam should be kept. While not everyone Thursday night agreed on how best to change the specialized high school admissions process — if at all — they seemed to agree that there is no magic bullet. Harry Lopez, a 1999 graduate of Brooklyn Tech, told NBC News before the forum began that parents play a vital role. Dayana Alexandre, the daughter of immigrants from Haiti and another 1999 graduate of Brooklyn Tech, agreed with Lopez. Both said there needs to be more investment in early education. They also were against scrapping the exam. The city Department of Education does have programs that offer some disadvantaged and underrepresented public and charter school kids preparation for the specialized high school exam. But some wonder why so much test prep is even necessary if all public schools were truly preparing students to meet the demands of the specialized high school exam in the first place. As part of his overhaul, de Blasio is also expanding the Discovery Program, which offers specialized high school spots to students who miss the exam cut-off score within a certain range and who attend a summer program. The program, also enshrined in state law, is designed to increase enrollment of low-income students. The mayor’s expansion, which will amount to 20 percent of seats at each elite school, began with admissions for September. The city also adjusted program eligibility to target students in high-poverty schools. With these changes, the mayor’s office estimated that offers to black and Latino students would increase from 9 percent to roughly 16 percent. Data released by the city Department of Education this week show a slight uptick in offers to black and Latino students through both the test and Discovery invitations. Those groups combined made up 14 percent of offers this year, compared to 12 percent in 2018. For the Discovery Program alone, 922 students received invitations this year, compared to 778 in 2018, though some ultimately will not qualify. The share of Asians extended Discovery offers jumped from 43 percent in 2018 to 54 percent this year, while for whites it decreased from 26 percent in 2018 to 15 percent. Blacks edged up from 10 percent to 12 percent, and Latinos from 12 percent to 18 percent, figures show. The city Department of Education expects to fill around 500 Discovery seats, based on the final pool of eligible students and historic enrollment. In December, a group of Asian American education advocates sued the city in Manhattan federal court, alleging that changes to the Discovery Program prevent Asian American students from vying for those seats. It was unclear how gains made by Asians in the Discovery Program might affect that case, which is still pending. Liu, the state senator, said another community forum is planned for Brooklyn in May. In a phone interview Friday, Liu called the Queens one productive. Regardless of the track ultimately taken to address specialized high school admissions, many attendees Thursday night said ramming changes through too quickly was not the answer. “It’s going to take a generation,” Lopez said.